U.S. Median Home Price in July at Highest Level Since September 2008IRVINE, Calif. – August 27, 2015 — RealtyTrac® (www.realtytrac.com), the nation’s leading source for comprehensive housing data, today released its July 2015 U.S. Home Sales Report, which shows sales of properties in-foreclosure and cash sales were down from a year ago to multi-year lows while year-to-date U.S. home sales in 2015 are at an eight-year high, and the U.S. median home price in July was at an 82-month high. The sale of properties sold while in the foreclosure process (not including bank-owned properties) accounted for 6.4 percent of all single family and condo sales in July, down from 6.6 percent of all sales in June and down from 8.0 percent in July 2014 to the lowest monthly share since January 2000 — the earliest that data is available. All-cash buyers accounted for 22.6 percent of all single family home and condo sales in July, down from 23.7 percent of all sales in the previous month and down from 26.5 percent of all sales in July 2014 to the lowest percentage of cash sales in a month since July 2008 – a 7-year low, and down from the most recent peak of 39 percent in February 2013 (highest going back as far as RealtyTrac has national data, January 2000). A total of 1,344,129 single family homes and condos sold in the first six months of 2015, according to public record sales deeds collected by RealtyTrac, the highest number of sales in the first half of any year since 2007. The U.S. median home sales price in July was $189,500, up 2 percent from the previous month and up 2 percent from a year ago to the highest level since September 2008. Out of 161 markets analyzed for home sales prices (excluding non-disclosure states), 10 metros (6 percent) reached new home price peaks in July, and 20 percent of the 161 metro areas analyzed have hit new home price peaks in 2014 or 2015. Out of 190 markets analyzed for home sales volume, 124 (65 percent) reached an eight-year high in home sales through the first half of the year, and 26 markets (14 percent) were at a 10-year high for home sales in the first half of 2015. Four markets reached an all-time high for sales volume in the first half of the year since 2000, the earliest data available in the report: The Villages, Florida; Lincoln, Nebraska, Pittsburgh, and Denver. Metros with the highest share of cash sales in July were all in Florida — Sebastian, Florida (54.6 percent), Homosassa Springs, Florida (53.3 percent), Sebring, Florida (52.6 percent), Naples, Florida (50.2 percent), Port St. Lucie, Florida (49.1 percent), Punta Gorda, Florida (48.7 percent), The Villages, Florida (48.4 percent), Miami, Florida (47.6 percent) and Sarasota, Florida (47 percent). Other major metros with a high percentage of cash sales in July included New York, New York (43.2 percent), Orlando (37.6 percent) and Tampa (35.3 percent), Las Vegas (32.6 percent), Rochester, New York (32.6 percent), and Detroit (31.9 percent). 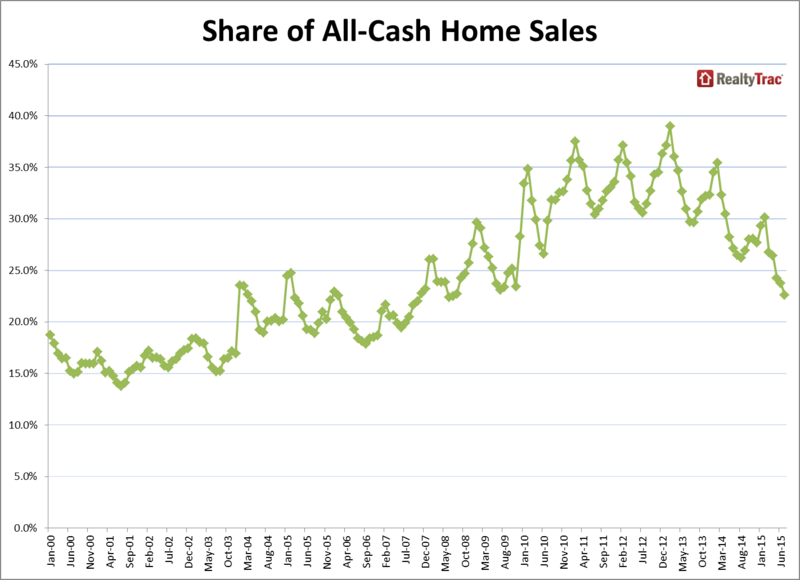 In 57 of the 200 markets analyzed for cash sales (29 percent), the share of cash sales increased from a year ago, counter to the national trend. Those markets included New York, Los Angeles, Philadelphia, Baltimore, Denver and San Jose. Metros with highest share of in-foreclosure properties in July were Salisbury, North Carolina (23.6 percent), Rockford, Illinois (17.1 percent), Morehead City, North Carolina (16.3 percent), Baltimore, Maryland (16.1 percent), Toledo, Ohio (15.2 percent) and Chicago, Illinois (14.7 percent). Other major metros with a high percentage of in-foreclosure properties in July included Tampa, Florida (12.7 percent), Las Vegas, Nevada (12.3 percent), Milwaukee, Wisconsin (11.7 percent), Virginia Beach, Virginia (11.4 percent) and Cincinnati, Ohio (11.3 percent). 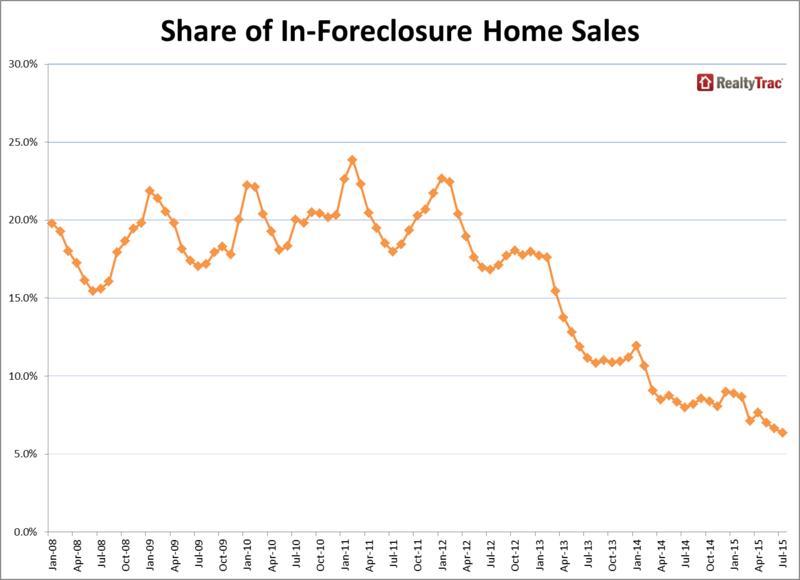 In 61 of the 172 markets analyzed for in-foreclosure sales (35 percent), the share of in-foreclosure sales increased from a year ago, counter to the national trend. Those markets included Chicago, Atlanta, Boston, Baltimore and Pittsburgh. The RealtyTrac U.S. Home Sales Report provides percentages of distressed sales and all sales that are sold to cash buyers by state and metropolitan statistical area. Data is also available at the county and zip code level upon request. The data is derived from recorded sales deeds, foreclosure filings and loan data. Statistics for previous months are revised when each new report is issued as more deed data becomes available. All-cash purchases: sales where no loan is recorded at the time of sale and where RealtyTrac has coverage of loan data. Properties in-foreclosure: a sale of a property that occurs while the property is actively in some stage of foreclosure (NOD, LIS, NTS or NFS). This includes only sales to third-party buyers or investors not involved in the foreclosure process. It does not include property transfers from the owner in default to the foreclosing bank or lender.